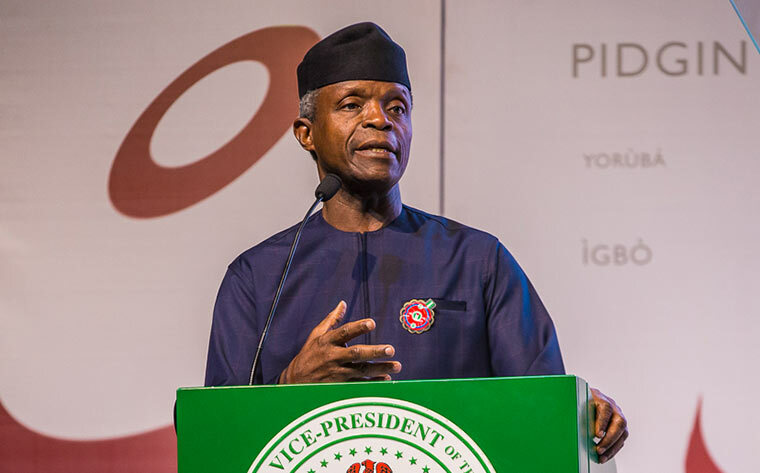 Vice - President Yemi Osinbajo has called on Nigerians not to be deceived by the electoral promises of opposition political parties, describing them as lies. Osinbajo made the call on Monday at the palace of the Olota of Ota, Oba Abdulkabir Obalanlege, in continuation of the Buhari / Osinbajo presidential campaign tour. Osinbajo was accompanied by the Ogun State All Progressives Congress governorship candidate, Dapo Abiodun; his running mate, Mrs Noimot Oyedele; Senior Special Assistant on Political Matters to the President, Senator Babafemi Ojudu; and Chief Tolu Odebiyi, a former chief of staff to the state Governor , Ibikunle Amosun. He said, “It is not that we don ’t have budgetary allocations for all projects, but the problem we have is corruption. “If you look at our budgets in the last ten years, the government had made provisions for them. For instance, Lagos/Ibadan road and Lagos/Kano railway projects were awarded ten years ago and yet nothing was done. The contractors that handled them collected money and did nothing. While responding to the requests of the Olota of Ota, Osinbajo appealed to the monarch, Council of Obas in Aworiland and the people to cast their votes for all the candidates of the APC in the forthcoming general elections. In his remarks, Abiodun promised to fulfil his electoral promises if he is elected. The APC governorship candidate said he was sad to see the deplorable conditions of the road in the community, which hosts multi - national companies that generate substantial amount in internal revenue to the coffers of the state government. Earlier in his welcome remarks, Oba Obalanlege presented the vice -president and his entourage with the problems facing the Aworiland. The monarch said, “Aworiland is accommodating and we are in both Lagos and Ogun states. “I want to seize this occasion to tell you we have been relegated and which should not be. We have massive votes in Aworiland and which ought to translate to political power but rather, we have been marginalised. We are neither Yewa nor Egba. Funny enough, we have been merged with Yewa and Egba traditional councils. Now, we are like the biblical Israelites without route. Please, help us to look into this issue,” the monarch said.